Knowledge of whether it will rain today will save you from the cold. Knowing how hot it is on the street will not let you put on extra clothes. Knowledge of how cloudy it will be in the evening will ensure you and your girl a guaranteed romantic dinner with the stars. As you can see, knowledge about weather conditions greatly helps to live. And that’s why some people watch TV only for weather forecasting. Actually, even this is now outdated – the Internet provides the user with almost everything necessary. And now there is also a smartphone, on which the special weather program can be installed. We offer to your attention 19 BEST WEATHER APPS FOR YOUR PHONE. They are the most popular and well-proven weather services on Android with an elegant interface, detailed, timely information and lots of functionality. With their help, you will know exactly what the weather expects you in the coming days, next weekend and next week. 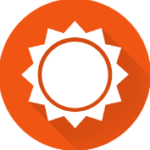 AccuWeather is considered to be one of the best applications for a weather forecast. Analyzing various weather data from around the world, the program reports the temperature and precipitation during the next day and in any chosen town very accurately. This full-featured application not only updates the forecast every hour but also has several additional meter parameters, as well as customizable color themes. The main screen not only informs the current temperature and precipitation data but also tells how it feels on the street. This is quite valuable information in situations where the thermometer, for example, shows +5, and because of the humidity and wind in the street, you feel like there is -1. Detailed information about the weather at the moment will also tell about such parameters as dew point, pressure, and visibility. Hourly forecast is perhaps the most important function of this application. In situations with frequent weather changes, when it rains several times during the day, and then the sun shines again, this information is irreplaceable. At the same time, the accuracy of the forecast is very close to reality. The forecast for a few days ahead is simple, informative and accurate enough. *Easy application and comfortable use. AccuWeather brings useful information for a comfortable day, and the use of the program brings positive feelings. The application AccuWeather is shareware, so access to the use of the program is not limited, but in the free version called Classic, you will face advertising. Weather & Clock Widget has advanced functionality, and looks good, despite years. Weather & Clock Widget interface. It is divided into six buttons – weather, my location, my cities, a map, about the program and settings. Of course, there is advertising at the bottom. Here it is possible to choose a weather forecast provider – Foreca or MyWeather2.com, and also to establish a usual or not unit of measurement for temperature, wind speed, pressure, precipitation and even visibility. By the way, by default, there are Fahrenheit. The widget is configured separately. So, you can choose the style, the text color, set the shadow for it, the font of the clock and date, the size, specify the application for the clock and calendar, adjust the display of weather parameters, moon phases and much more. In general, there is a complete customization. You can also use notifications in the status bar, as well as sound alerts about changes in weather conditions, what is very convenient when using the program in the car. Weather & Clock Widget is a beautiful and informative weather service but which directly affects the battery consumption. Fortunately, you can turn off animation, reducing the power consumption, and choose the simpler widget. This application uses several weather forecasters at once, includes offline mode of operation, can be updated on a schedule, and also use only a Wi-Fi connection for this. At first glance, we have a simple, but at the same time informative solution. The Weather BZ design and features. Most of the screen is (as expected) weather forecast. But at first, we are offered to choose a city. Then we can assume that there is no active GPS in the program, although it is available. In the menu, you can select cities, view the phases of the moon, and apply themes. The GPS module is activated separately. The set of available places is impressive. There are a lot of settings. It is worth noting the possibility of choosing a weather forecast provider (Foreca, Weather Underground, and AccuWeather) and a city database (Foreca and AccuWeather). Thus, you will be able to view the weather from all over the world. You can also select elements to be displayed, moon phases for a month or year, units of measurement (pressure, temperature, etc. ), as well as the color of the text. It is possible to hide the bottom panel with tools, in order to completely unload the interface. There is also a system of notifications, including the hourly forecast and the information about the current weather. You can also use an auto-update function, which can be disabled. It is possible to choose the interval for uploading data, for example, every hour. You can set updating only on Wi-Fi and not be updated in roaming – it helps a lot when traveling. The weather is often changeable and merciless to our plans. The GO Weather application will help you stay informed about weather changes. The program is quite simple, one minus is a permanent advertisement, which stops bothering you when you buy a paid version. The program requires an Internet connection. How it works. When you sign in to the application, you are prompted to enter the location immediately. If there are a lot of places with this name, you just need to choose the option that suits you from the offered list. After all the manipulations, we get to the main screen, represented by a beautiful image, which depends on the weather conditions. In the bottom left corner all the necessary information, represented by the temperature and the weather situation is displayed. If this data is not enough for us, then we scroll the list up and there we can see the forecast by hours, forecast for the week ahead and much more. As for the parameters, in GO Weather we can change not only the units of measurement but also something else. So, for example, you can turn on the morning notification (weather report) and set an alert for a global increase or decrease in temperature. You can also tell friends and relatives about the weather in the place where you are now. For this, select “Share Your Weather” from the sidebar, then click on the “Screenshots” button. The image data can be transferred via Bluetooth, placed in social networks and sent to the cloud disk. What do you need from a weather application? Yahoo Weather offers a beautiful and comfortable design, provides us with a detailed weather forecast and at the same time is equipped with interesting features. Immediately after the downloading, the application is ready for use, and we get to the main screen of the Yahoo Weather program. And it is presented by a beautiful image, not just some kind of a picture, but a real photo of the area. Of course, there are no photos from small places, but there are plenty of popular cities. The weather and temperature are also displayed. As soon as the sun disappears behind the clouds and it rains, we immediately notice this on our screen. There will be a beautiful weather animation. And the developers envisaged not only the animation of rain and snow but also lightning, wind, and fog. In the application, we will find information about the temperature and weather conditions for each hour, for five and ten days ahead, about precipitation, wind, humidity and time of sunrise/sunset. Additionally, we can view the location of the city on the map. You can add several cities to quickly switch between them. It is possible to change the units of temperature, set the amount of traffic for weather updates, and also include animation and weather alerts. Yahoo Weather is a beautiful and convenient weather application. The forecast itself is presented with all possible data, and even for ten days ahead. As for functions, widgets and everything else – this is a classic weather application. But unlike its competitors, there is an animation of weather conditions. In addition, the application is free and does not contain advertising. It will be very pleasant to use the YoWindow application to those users who appreciate not only the accuracy and correctness of the weather forecast but also the visual component. When you download the app, you will have a training course how to use it. We will be told and shown what to do and where to press, but then we will act ourselves. The main screen of YoWindow is represented by beautiful scenery and basic weather information for the next ten days. It is interesting that when you scroll the weather for every hour, not only the temperature changes, but also the background picture, or rather its state. It is “alive”, that is, something constantly happens on it, so it also changes depending on the time of day and the state of the weather. Everything is beautiful and in addition, is accompanied by a soundtrack. If there is not enough information about the temperature and weather conditions, then you can press the temperature readings, after this, a window with additional information will appear. Another feature of YoWindow is that the weather can be set as a wallpaper. By the way, as soon as we install the wallpaper, we will also be offered a widget. There are six types and they are represented by clocks, as well as by various additional information. 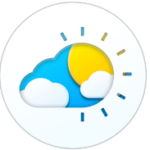 YoWindow is a beautiful and high-quality weather program foAndroid-devices. As for the weather itself and forecasts, then everything is simple and utilitarian. But unlike most tested applications, there are three data sources, which allows you to choose the most accurate weather service. The visualization of the weather is done elegantly, we note a very beautiful living background. Are you going on vacation – to the mountains, to the sea, the end of the world? Or in school, or on a date – and do not know which clothes to choose? All of these questions will be answered competently by The Weather Channel, a mobile application that predicts the weather for any place on the globe – in your hometown, in the mountains or on the coasts of the seas and oceans. Thanks to data from 200 meteorological stations, weather forecasts are very accurate. The application interface is made in a laconic blue color and looks very simple and convenient. Also, the application boasts an accurate finding of your location. Opening the application on the main screen, you will see the weather outside the window for the moment, and to view the weather in advance, you need to go to the second window. To all this in the application has an online map-radar, which displays the movements of cyclones and clouds. And for a more convenient viewing of the weather, there are three widgets that can be placed on the main screen of your device. *Detailed weather forecasts (hourly, 36 hours and 10 days). *Accurate Google maps with your location with a weather radar function. *Sound messages about bad weather and storms. *Easy management of your location, which allows you to quickly view them. *Local forecasts and popular videos. The Weather Channel is a program that will allow you to know the weather at any time of the day and night anywhere in the world. Weather Live is amazingly beautiful and quite simple to use. With this application, you can learn about the weather around the world. Weather Live always shows the current weather changes. It is enough to set the slider to turn on weather change notifications in the settings. You can also always be aware of the morning and evening weather if you put the slider in the appropriate position. Now there is no need to look at the thermometer or look for the weather on the Internet. In the settings, you can set in which units the weather will be displayed, as well as wind speed and pressure. A very convenient feature, which you can activate in the settings – showing the temperature on the application’s icon. It will be shown in the same way as an unread notification. You can also set silent alert mode, the detailed or compact widget. You can find the weather in the necessary place by going to the application itself. The weather is shown for a week ahead, and everything is done very beautifully, with colorful weather and time animation, the time of sunrise and sunset is indicated, the minimum and maximum temperature for today and for any chosen one. You can also enable the hourly forecast. If you click on any day, a graph of the temperature change will appear. If you need to view the weather not only in your location, you can add any other city. An interesting solution is to “share with friends“. By clicking on the weather screen a small icon in the form of a square with an arrow will appear, so you can make a screenshot and immediately send it to any social network or by mail. Weather Underground seamlessly integrates into the smartphone’s info panel and allows you to monitor the weather conditions in real time. As for the settings, everything is simple – just choose between Celsius and Fahrenheit, miles and kilometers, and also the Forecast type. There you can also choose the theme. The most important element of this weather application is the information itself. For example, on the street, there may be + 11, but because of strong wind and high humidity, you will feel as it is + 2-3, instead of the preset + 11. This application is able to compare all the important characteristics of the weather and give you the temperature that a person actually feels. In addition, you can easily view the wind speed, precipitation per day, precipitation for a week, find out the atmospheric pressure and other things. Wind speed displayed in the app will allow you to decide whether to go for a jog or to sit at home better, and precipitation throughout the day will tell you how to behave at a certain time. The interface in the application is very clear, simple. *Current weather conditions from the nearest weather station, including temperature, wind speed, and direction, humidity, dew point, visibility, pressure, gusts, and phase of the moon. *Forecast for 10 days, including a textual summary. *Hourly forecast, including the time of sunrise and sunset. *Data for the past period. *Interactive map with all nearest weather stations, animated display of radar data, satellite map, webcams and much more. *List of saved favorite locations and recent search results. *Reports on the snow cover for winter sports. We can not say that this application is the best in the market – there are cool things like real weather, as well as completely useless for the average user. On the other hand, if you are a traveler and the wind speed with precipitation is not an empty sound for you, then this application will become a good helper in your daily life. In addition, you do not need to pay for using all the functions, and if you are not against some advertising in the application, you can not invest anything at all. A worthy competitor in its segment. The interface of the main menu of the program provides the user with the most detailed information about the current day, with reference to the selected city. At the bottom of the main menu of the program, there are three function keys that allow you to switch between the information menu for the current day of the week, for seven days and photos from satellites. WeatherBug has some uncharacteristic features for the rest of the weather applications. First, WeatherBug has information about traffic, so with the application, you can very successfully bypass all city congestion and traffic jams. Secondly, the tool has a system of reminders. As for weather information, WeatherBug allows you to get very accurate data: separately for the center and the suburbs. WeatherBug provides maximum accuracy of forecasts and weather data for any coordinates on the globe. It is especially useful to use the application in areas with high probability of natural disasters when every minute counts. Timely notification will help to take the necessary measures and avoid the danger. The most accurate weather data due to the use of more than two million weather stations around the world surpasses most competitors. All the features of the program are presented in a very simple form, so the program can be easily configured, as the user wishes. With the help of the function buttons that appear when you start the program, you can turn on the various operating modes of the program. For example, by clicking on one of them you can view the weather conditions for the current date or for a few days ahead, you can get information about the speed and direction of the wind, humidity and air pressure, the time of sunrise and sunset, the amount of future rainfall and much more. The “Share 1Weather” option allows you to share the weather forecast with your family and friends when sending this information to other devices. You can also change the place for which the weather forecast is made thanks to the “Add Location” function key. The most simple and convenient application that will show you the weather conditions depending on your current location. Management in the program occurs due to swipes – simple and practical. When the application starts, we are greeted by the main screen with the current weather by location, by a swipe to the right, the application shows the weather in the next 24 hours, and the next screen shows the weather for the next 5 days. Unfortunately, the application only displays temperature and possible cloudiness, you will not find here information about pressure, humidity, etc. In the program, there are two widgets. The program, of course, is distributed free of charge and does not contain additional purchases. If you like minimalism, then you will like the program. Weather Timeline is an excellent information application for tracking weather conditions for one day, breaking the forecast by the clock or displaying data for several days or weeks ahead. 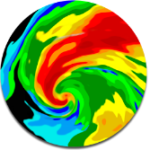 If desired, the data can be painted in different colors to visually know about difficult weather conditions, sunny days, a hurricane and other atmospheric phenomena. 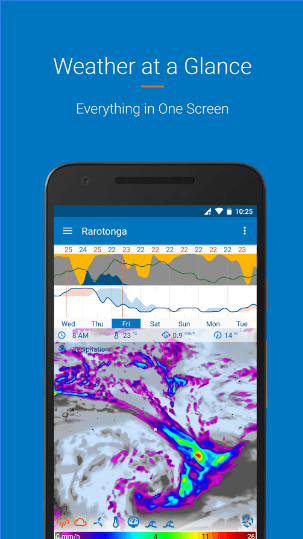 You can configure all necessary parameters in the Weather Timeline Forecast application for Android, edit the interface and manage the history of observations. Thanks to the unique “time machine” function, you can move a few years or decades ago to find out what the weather was like in those days. Data can be saved or sent to friends, synchronized and analyzed. Unlike competitors, in this application, there are no superfluous functions, advertising, and annoying offers. All that you really need. The program has all the necessary settings, even more than enough. You can significantly customize the interface, turn on alerts for bad weather conditions, set up units of measurement, select a weather provider and even set up synchronization with smart clocks. Temperature: objective – with the help of precise measurements, and subjective – “by sensation”; Precipitation in percent; Humidity and atmospheric pressure; Wind speed and direction; Visibility on roads; Time of dawn and sunset; Weather forecast within 24 hours or 7 days. Units of measurement can be displayed in different standards. Transparent clock & weather is an application that displays weather in real time. You can customize the functions at your own discretion and choose wallpaper. When you first start the app, it automatically locates. If there are any problems, you can always enter it manually. The main screen with the weather forecast in Transparent clock and weather has a static background characterizing the current weather in the specified location. In the additional menu or by clicking on the check mark in the upper right corner, you can select additional locations. In the app, there are 3 widgets. The widget specifies the selected location, weather forecast, date and time, and the battery indicator. The transparency of the widget is about 30%, and the information on it remains readable. Transparent clock and weather settings are divided into 6 categories, you can easily configure all interface elements, update frequency, and other parameters. After installation, Flowx can confuse you with its somewhat unusual appearance. The developers clearly tried to fit a maximum of useful information into one screen and the interface turned out to be somewhat overloaded. However, after using it for some time, you quickly come to the conclusion that everything is done quite conveniently and visually. The main feature of the program is the presence of an animated map, which displays meteorological information about precipitation, cloudiness, and wind. In general, Flowx has a non-standard and serious approach to displaying meteorological information. With its help, you are no worse than television commentators will be able to talk about the atmospheric fronts and anti-cyclones. Today Weather is one of the most beautiful and simple weather apps for Android. It shows a detailed weather forecast, which is illustrated by different photos. Most of the weather apps on Google Play draw data from the same sources. Therefore, the accuracy of the forecast is the same, and the difference is only in their representation. So, the choice of an ideal weather application is the choice of an understandable and beautiful application. And from this point of view, Today Weather is ahead of all. During the first launch, the program will offer you to enable GPS or specify your location manually. After that, Today Weather will display detailed information about the weather conditions. The forecast is illustrated by photos specially selected for the current meteorological situation in the area. If you want to see the forecast for a few days ahead, then just make the swipe up. You will see a diagram of temperatures, the probability of precipitation, data on air pollution and other useful information. In addition, the program provides the ability to place weather widgets and also can show the weather in the notification line. You will always be aware of the temperature and cloudiness outside the window, even without opening the main Today Weather window. After installing the program, a widget appears in the notification panel. With it, you can quickly find out the short weather forecast for the next few hours and other information: the content depends on the selected theme. In addition, the application has three customizable widgets for the desktop. You can choose different themes for the Weather Wiz widgets and customize their appearance. As a result, not only the colors will change, but also the amount of data that is displayed on the widgets. If you need more detailed information you can find it on the main screen of the application. Just click on the widget to open the app. Here, Weather Wiz shows the current weather conditions and forecast for 24 hours: the number of degrees, local time, cloudiness, a graph of temperature changes during the day, and other parameters. You can also quickly switch between different locations. To do this, you need to add several locations in the Weather Wiz menu in advance. Having made a swipe up on the main screen, you will see a more detailed weather forecast for the day with such indicators as wind speed and direction, precipitation and ultraviolet radiation levels. Repeated swipe up will display a weather forecast for ten days. And beneath, you will find the time of dawn, sunset and even the phase of the moon. The free version of Weather Wiz can be annoying with full-screen advertising. To get rid of ads, you need to pay. This application is now recognized by users as one of the best options for everyone who always wants to be aware of upcoming changes in the weather. So, downloading the above application, the user gets a lot of interesting opportunities and the embodiment of great creative ideas in the design of the interface. Downloading the application you will receive, among other things, excellent and appropriate to all the requirements of good taste, animated wallpaper and an excellent widget for home display. 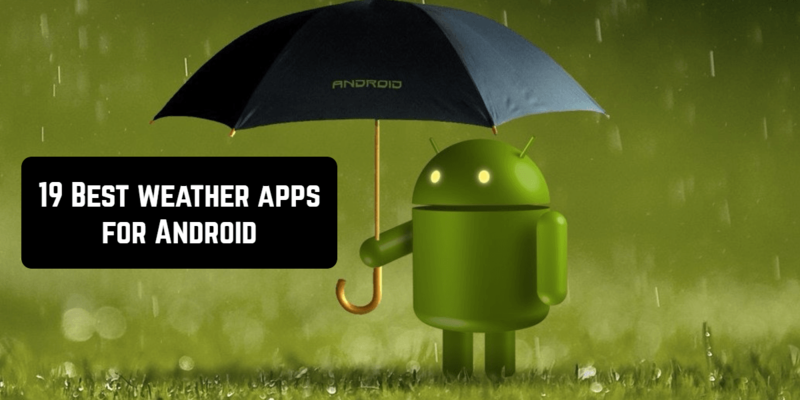 So, this was our overview of the top weather apps for Android. Thank you for getting to know the information and applications. Perhaps you will choose an application from the list for yourself.